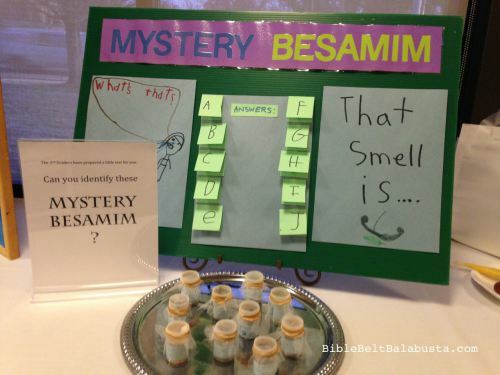 "Besamim work is a rich, smelly, hands-on opportunity to create memorable links to Shabbat (and to being Jewish). You choose: make a garden, a pot, a sachet, an herb buffet, an etrog pomander, a “Smell Test,” or besamim containers simple and fancy... The basic requirements for Havdalah besamim are that they smell good and are natural. The “smell good” part is subjective: what smells marvy to one kid might stink to another. The fragrance is supposed to console us as Shabbat—and our temporary “extra soul” / neshama yeteira—depart."